Was the latest redesign even necessary? The Toyota Avalon. The large sedan that has consistently done a fine job hovering between mainstream and luxury. It has reached a level of premium and luxury that caused many to wonder what was the point of the Lexus ES. But here’s the thing: the Avalon is a phenomenal bargain compared to its Lexus cousin. For thousands less, one could acquire a big, front-wheel drive sedan with all of the fixings without having to pay for a certain luxury badge. For 2019, the Avalon has been completely redesigned, riding on the automaker’s global TNGA platform, and looking quite a bit different from its immediate predecessor. Put it like this: if you’re not a fan of Lexus styling, notably the spindle grille, then the new Avalon may not be for you. While not as dramatic looking as a new Lexus, the latest Avalon is more emotional than ever. It’s not just grandpa’s favorite cruiser anymore. But if it’s not only for gramps, then who’s the target audience? Younger baby boomers who have yet to take the crossover plunge. They don’t want or even need a crossover for any number of reasons and prefer to stick with what they know. Toyota’s familiar 3.5-liter V6 with 268 hp and 248 lb-ft of torque and the hybrid’s 2.5-liter four-cylinder combined with an electric motor for a total of 200 hp. Both are linked to a six-speed automatic transmission sending power to the front wheels. Not exactly sport sedan credentials, but the Avalon never pretended to be anything other than a comfortable cruiser. If you’re looking for a bit of fun, the Touring trim offers a sport-tuned suspension. So there’s that, but there’s an added bonus for this trim: at $37,900, it undercuts some of its similarly priced competition. The base Avalon begins at $33,500 and ranges up to around $43,000 for a fully loaded Hybrid Limited. Not bad. It’s a lot of premium car for the money without having to go all Lexus pretentious. What will the new redesigned Avalon bring to the table? 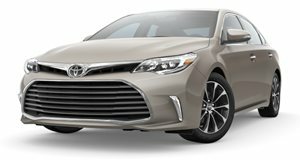 Well, that remains to be seen, but considering Toyota opted to continue with the Avalon in the first place indicates the new car is superior enough to its immediate predecessor. Toyota understands it can’t get away with dull any longer, and the new Avalon’s design proves that. Not only has its wheelbase grown by 2 inches, but the new Avalon is also lower and wider. Thanks to its newly set-back greenhouse, the hood looks longer and the trunk shorter. Combined, this creates a far more athletic and luxurious look. The new front end is, uh, interesting. This writer was looking at the new Avalon with an unnamed Kia executive at Detroit last January and we both agreed designers didn’t know when to lift the pen. It’s called trying to do too much with something that ought to remain simple. Then again, we both appreciated Toyota’s effort to add some spice. Out back, for the first time the Avalon receives quad exhaust tips. From the side, the angular, chiseled look continues with a sharp character line dipping down at the rear door handle, and picks up again beneath the C-pillar. There’s a second, lower line beginning behind the front wheel arch and tapering off at the rear bumper. Again, nothing wrong with adding some hot pepper to a bland bowl of pasta; just depends on whether you like bland or not. Power, once again, comes from a V6, although this one is new, more powerful (Toyota has yet to release official figures, but this same engine has 301 hp in the new Camry) and paired to an eight-speed automatic. A hybrid version also returns, featuring an Atkinson-cycle 2.5-liter inline-four with a CVT automatic. Also like before, all Avalons are FWD. The new interior is also a marked improvement, looking more Lexus-like than ever, especially with 9-inch touchscreen, color head-up display, and wireless charging. Pricing will begin at roughly the same as the outgoing model, and sales will get underway in the spring. Given all of the effort put into the new Avalon, . Toyota knew full and well the Avalon couldn’t continue unless a dramatic redesign took place (the slowing sales figures prove this). We’ll just have to wait and see if the redesign efforts will pay off. If not, well, just look at the impending fate of the Ford Taurus and Chevrolet Impala.